The Other Side of the Wind (2018) | "This Film Should Be Played Loud"
A bizarre miracle of restoration and a dizzying, bleary-eyed display of Welles’ effortlessly radical technique, quite unlike anything else he attempted. Turns out he was one hell of a 70s filmmaker. This is a proper full-meal for cinephiles, absolutely punch-drunk with striking imagery and illusory editing as well as featuring an onslaught of on-camera appearances from New Hollywood royalty, which includes but isn’t limited to: Peter Bogdanovich, Dennis Hopper, Susan Strasberg, Mercedes McCambridge, Curtis Harrington, Claude Chabrol and Paul Mazursky. John Huston lords over the entire party with a down-beaten machismo that is sure to enter the ranks of great unexpected performances now that it has been finally resurrected. The real star though, of-course, is Welles himself. 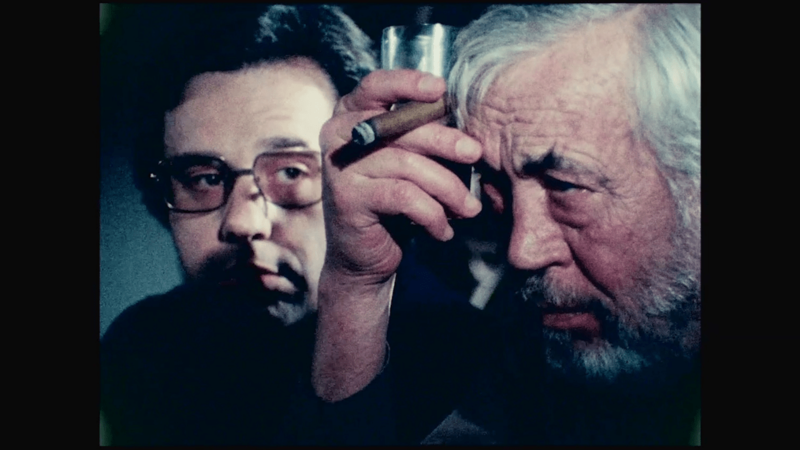 While his authorship of The Other Side of the Wind can be endlessly debated given the nature of its completion at the hands of others, it is nevertheless a virtuoso filmmaking performance, and one which left me awestruck. It is Welles reminding everyone from beyond the grave that he will always be cinema’s greatest magician. The film’s final lines, which double up as the last lines of Welles’ oeuvre essentially, are hard to beat. I can’t get them out of my head. Only in time will we see how important this movie is in the long run, but on a personal level – as a Welles nut and as someone who has read about The Other Side of the Wind for as long as I can remember, only ever dreaming to see it one day – this is one of the most important movies released in my lifetime. It’s a gift. This entry was posted in Reviews and tagged 2018, John Huston, Mercedes McCambridge, Orson Welles, Peter Bogdanovich, Susan Strasberg. Bookmark the permalink.